U.S. Army Corps of Engineers Statistical Software Package (HEC-SSP) developed by the Hydrologic Engineering Center. This software allows you to perform statistical analyses of hydrologic data. The current version of HEC-SSP can perform flood flow frequency analysis based on Bulletin 17B, "Guidelines for Determining Flood Flow Frequency" (1982), a generalized frequency analysis on not only flow data but other hydrologic data as well, a volume frequency analysis on high and low flows, a duration analysis, a coincident frequency analysis, and a curve combination analysis. 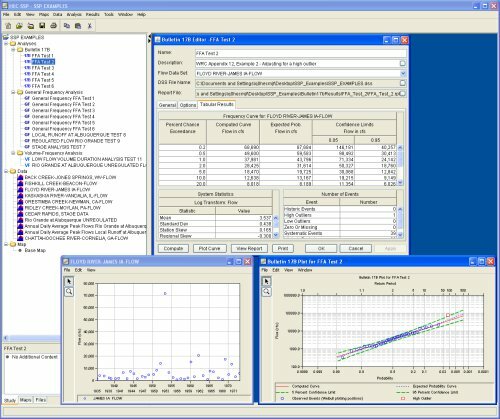 Flow Frequency Analysis (Bulletin 17B) – This component of the software allows the user to perform annual peak flow frequency analyses. The software implements procedures in Bulletin 17B, "Guidelines for Determining Flood Flow Frequency", by the Interagency Advisory Committee on Water Data. General Frequency Analysis – This component of the software allows the user to perform annual peak flow frequency analyses by various methods. Additionally the user can perform frequency analysis of variables other than peak flows, such as stage and precipitation data. Volume Frequency Analysis – This component of the software allows the user to perform a volume frequency analyses on daily flow or stage data. Duration Analysis – This component of the software allows the user to perform a duration analysis on any type of data recorded at regular intervals. The duration analysis can be used to show the percent of time that a hydrologic variable is likely to equal or exceed some specific value of interest. Coincident Frequency Analysis – This component of the software assists the user in computing the exceedance frequency relationship for a variable that is a function of two other variables. Curve Combination Analysis – This component provides a tool for combining frequency curves from multiple sources into one frequency curve. * HEC-SSP download link provides gnu general public license version of the software for Windows 64 bit and Windows 32 bit. HEC-SSP has been rated 4.3 out of 5 points. A total of 3 votes cast and 0 users reviewed the software.